We have TWO new designer paperpads bursting of colours, with awesome patterns all ready for your projects called Happy Fall and Wicked, with a perfectly coordinated Wicked cardstock pack! 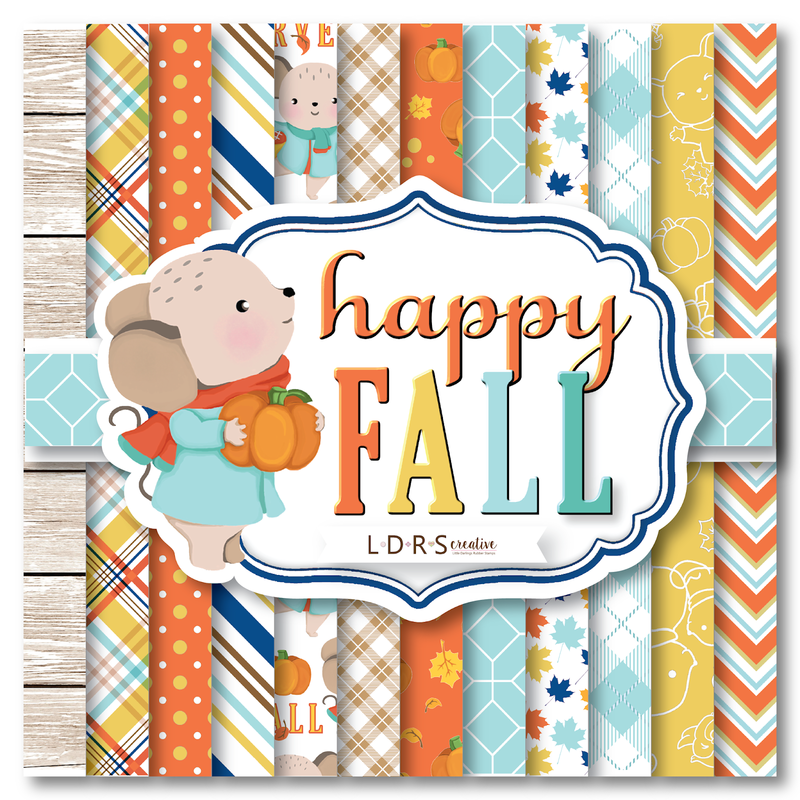 There are EIGHT stamp sets that are simply fabulous: Winds are Blowing, Happy Fall stamps, Happy Fall sentiments, Winnie Broomstick, Winnie Dracula, Winnie Magic, Fall Full O Leaves and The Magic of Fall sentiments! 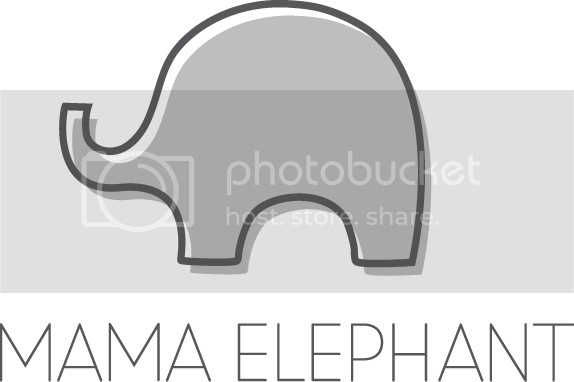 But wait, there is something brand NEW in the store, stencils! We have leaves and plaid patterns just in time to use with the NEW mini ink cube sets (Cobblestone and Jewelry Beads)! We also have new die sets that can be used as accessories or full backgrounds: Spooky Hat, Punkin, Wicked Boot, Apple A Day and Autumn Breeze Peek-A-Boo. And for the first time at LDRS Creative, you can grab them in bundles, because you KNOW you need them all! 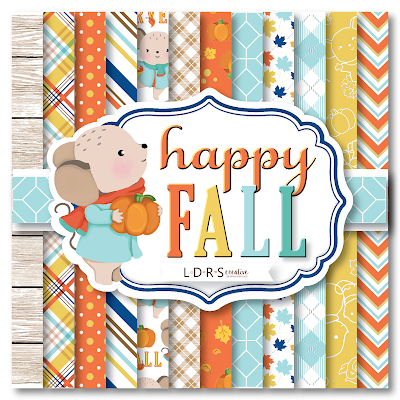 Today I am sharing this sweet card I made today featuring adorable images from the newly released Happy Fall stamps. First, I stamped the images and colored them with watercolor markers. I fussy cut them all and set the aside to work on my background. Next, I used some blue painter’s tape to mask off the sides of a piece of white cardstock. I inkblended the sky and grass and let it completely dry before heat embossing a sentiment from Happy Fall sentiment that went perfectly with my scene. I love pumpkins in the fall! Next I cut this piece down to 5 x 3.75 and mounted it onto some pattern paper from the new Happy Fall paper pad. I adhered my colored images with foam tape for dimension and popped the entire thing onto an A2 cardbase. I love how sweet this turned out and I hope you like it too! Thanks for stopping by! Oh so adorable!! Love this stamp set!!! This is so precious and sweet! Your coloring is awesome; love the design; love it! Oh my!!! Your card is totally sweet and cute!!! Adorable coloring!!! Such a sweet card! Love the scene you created with the pumpkins, mouse and bunny! Adorable critters! And beautiful coloring too! Perfectly sweet card! Love the soft colors and lovely scene. Just darling! What a cute little scene! AWWWWWW what a precious card! I am sooooo loving the scene that you ink blended! The colors are absolutely gorgeous together! So sweet. 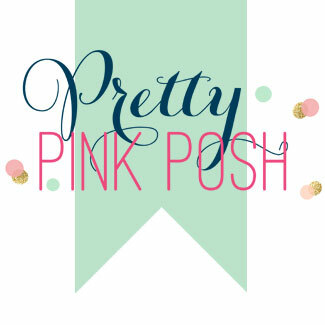 I like the soft colors. Your card is just the sweetest! I love these little critters. And the sentiment used is precious.